This elegant, Art Deco-style, limestone-clad church is one of only two religious structures on Fifth Avenue on the Upper East Side. The other, to which it bears a stylistic resemblance, is Congregation Emanu-El, on the northeast corner at 65th Street (see The City Review article). This site was acquired in 1917 by Andrew Carnegie whose huge mansion and garden, now the National Design Museum of the Smithsonian Institution, is directly across 90th Street. Carnegie wanted a "light protector" on this site for his large, fenced garden and in 1924 his widow offered it in 1924 to the Episcopal congregation of the Church of the Heavenly Rest, which was founded in 1865 was located then in a structure on Fifth Avenue at 45th Street. The church commissioned the architectural firm of Mayers, Murray & Phillip, which was the associate architectural firm for the design of Congregation Emanu-El. Mayers, Murray & Phillip was the successor firm of Bertram Goodhue, an architect well known for his religious structures such as St. Thomas Episcopal Church on Fifth Avenue at 53rd Street (see The City Review article) and the St. Vincent Ferrer Roman Catholic Church on Lexington Avenue. "Goodhue's successors designed the new church in the 'American Gothic' manner. The boldly massed structure was erected with a modern steel frame and has austere limestone façades articulated by large pointed-arched openings and sculpted figures that seem to grow organically from the stonework. This is especially evident at the entrance with its figures of Moses and John the Baptist and its pair of winged angels. The front doors are worth close examination: the metal hinges are embossed with scenes of the history of religion (and this church congregation) in New York City. The magnificent open plan interior features vibrantly-colored abstract stained glass, fine carved woodwork, and a pulpit by sculptor Malvina Hoffman." The building was completed in 1929. "Their powerful, stripped-Gothic Church of the Heavenly Rest...relied on the striking contrast of broad areas of blank stonework with large-scale openings filled with delicate Gothic tracery. With its two squat turrets flanking the main entrance on Fifth Avenue accentuating the church's massive bulk and Lee Lawrie's sculptures over the door merging imperceptibly with the wall to heighten the sense that the building have been carved fom a single block of stone, the Church of the Heavenly Rest's heroic scale was in part a response to its unsympathetic context." 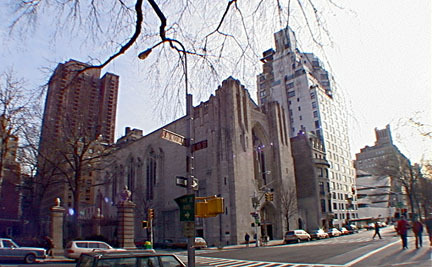 In his excellent book, "Glory in Gotham, Manhattan's Houses of Worship, a Guide to Their History, Architecture and Legacy," David Dunlap, published as a City & Company Guide in 2001 (see The City Review article), notes that Carnegie's widow, Louise, stipulated a 75-foot-high limitation on this site and that the sculptor Lee Lawrie also worked on the new church. "During a restoration, it suffered a devastating fire in August 1993. The stained-glass windows were spared, the Rev. C. Hugh Hildesley said gratefully, because firefighters carefully and deliberately used more complicated means to ventilate the 1,000-degree blaze," Dunlap wrote. The church has sponsored a series of jazz concerts for many years and is also home to the Canterbury Choral Society. It is adjacent to the National Academy of Art and it has two nice marble benches flanking its entrance. It is directly across from the Engineer's Gate in Central Park, which is an entrance to the running track around the park's reservoir and also an exit from the north drive in the park.